Ladies Den - House of Custom Stitched Salwar Kameez suits - We at Ladies Den have been selling Salwar Kameez suit materials and providing Custom Stitching on eBay since Nov, 2004. Now finally we have our very own web store. Please do sign up and Happy Shopping! - Jaswinder (Ladies Den). We currently have 1 in stock. We will custom stitch you a Kurti/Kurta for you similar to the picture shown in this item. 2. Kurti/Kurta length & Sleeves length you want. 3. Neckline if you want something different than shown in the picture. We will custom stitch the Kurta/Kurta for you according to your requirements within fabric constraints from the given fabric. Please look below for maximum size possible. Stitching Costs included in item price. Maximum Size Possible - Ready Size 50. Maximum Kameez/Top length possible is 40 inches. Maximum sleeves length possible is 14 inches depending on size. Kameez/Top length and Sleeves length will depend on material & your size. Heavier the size, more difficult it is to make long sleeves. 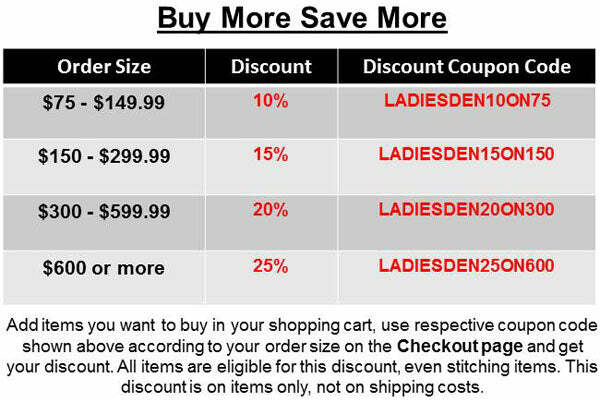 For any queries regarding what size is possible email us anytime to ladiesdenindia@gmail.com. Kameez/Top is of Printed thick Cotton. Colours mentioned above are very close to what they are in real. They may or may not appear exact on your monitor/screen. Item Weight - 0.245 kg --- This is an approximate weight keeping in mind packaging material as well. This weight will be taken as item weight regardless it is shipped unstitched or stitched. Fabric - Thick Cotton for Kurti/Kurta/Kameez. Embroidery/Weaving/Printing - Printed material to be used. Care - Dry clean for 1st 2 times for longer life and then hand wash, hang dry. Condition - New Custom stitched Kurti/Kurta. It does not have tags. Shipping - We will be using DHL express to ship the items with shipping time of just 3-7 working days depending on your location. Economy Shipping also available with shipping time 8-16 working days depending on your location. Please submit your size as soon as you can and allow us 3-5 working days for stitching time. You will be notified with tracking number when your package is shipped. Shipping Costs - Shipping will be charged according to weight. Weight of each item is mentioned right below item's colours. To see Shipping costs according to weight please visit Shipping Costs Chart page. Usually our items weigh in between 0.5kg - 1kg weight. So shipping for 1 SK suit item will be $15 according to Shipping Costs Chart. For 1kg - 1.5kg weight, shipping will be $18. Shipping rates may change from without any prior notice. Final Shipping costs will depend on the total weight of all your items. Please do check the weight of items you want to buy to get an idea of the final shipping costs. You can also go to Checkout page after adding the items in shopping cart to see final shipping costs. It will be updated on it's own according to the total weight of the items you want to buy. Shipping is FREE within India. Refund Policy - If you are not completely satisfied then we will be happy to accept returns for a refund, provided you show us a good cause within 10 days of receipt of item(s) and pay for the shipping to return the item to us. Please keep in mind most of our items are one-of-a-kind so therefore we might be not able to give you an exchange, therefore you will get a full refund of item cost in cash via Paypal only. The refund amount will be paid only after the item has reached us. For return authorization, Contact Us at - ladiesdenindia@gmail.com within 10 days of receipt of item(s). If you buy Unstitched Salwar Kameez then we will not accept returns if you have got it stitched from somewhere else and not from us. The return item must be returned/reach us within 50 days from the day payment is made to get refund in Paypal. If not then you will get an exchange only and shipping costs ($5/SK suit) for exchanged item/s will have to be paid by buyer. Customs Duties - Customs Duties and/or other levies in destination country are responsibility of buyer. It applies to all items brought from this whether stated or not. We will not be responsible for such charges arising in destination country.